Several randomised controlled trials suggest that mindfulness-based approaches are helpful in preventing depressive relapse and recurrence, and the UK Government’s National Institute for Health and Clinical Excellence has recommended these interventions for use in the National Health Service. There are good grounds to suggest that mindfulness-based approaches are also helpful with anxiety disorders and a range of chronic physical health problems, and there is much clinical and research interest in applying mindfulness approaches to other populations and problems such as people with personality disorders, substance abuse, and eating disorders. We review the UK context for developments in mindfulness-based approaches and set out criteria for mindfulness teacher competence and training steps, as well as some of the challenges and future directions that can be anticipated in ensuring that evidence-based mindfulness approaches are available in health care and other settings. There is an upsurge of development and interest in clinical approaches based on mindfulness meditation. Searching the Social Science and the Science Citation Indices (in January 2010) for the keyword “mindfulness” reveals 1–3 journal publications per year for the period 1977–1994, whereas by 2009, that figure has increased to more than 290 in a single year. Mindfulness-based interventions are now being integrated into the treatment of problems associated with a range of medical conditions including cancer, chronic pain, HIV, diabetes, arthritis, Parkinson's disease, and heart conditions and a range of psychiatric conditions including depression, anxiety, suicidality, head injury, dementia, drug and alcohol dependence, obsessive–compulsive disorder, eating disorders, and personality disorder (Baer 2003, 2005; Grossman et al. 2004). The range of therapeutic approaches based on mindfulness is increasing as more applications are researched and established. These include Mindfulness-Based Stress Reduction (MBSR) (Kabat-Zinn 1990), Mindfulness-Based Cognitive Therapy (MBCT) (Teasdale et al. 2000), Mindfulness-Based Eating Awareness Training (Kristellar et al. 2005), Mindfulness-Based Relationship Enhancement (Carson et al. 2004), Mindfulness-Based Relapse Prevention (Witkiewitz et al. 2005), and Mindfulness-Based Childbirth and Parenting (Vieten and Astin 2008). There are also a number of psychological therapies that integrate the attitudinal basis for mindfulness practice within them — amongst others, these include Dialectical Behavioural Therapy (Linehan et al. 1991) and Acceptance and Commitment Therapy (Hayes et al. 1999). In this article, we describe and discuss current developments in training for mindfulness-based teachers1 within the UK with the intention that this could be illustrative for other contexts. In this context, the term ‘mindfulness-based’ is used to refer to the MBSR and MBCT group-based interventions. MBSR is the parent from which most of these mindfulness-based applications evolved. MBCT is closely aligned to MBSR in its format, shape, and delivery style and so they share the same core training process. The two approaches differ in some subtle ways, and the training implications relating to these differences are outlined as they arise below. Inevitably, in this time of rapidly burgeoning interest in mindfulness-based interventions, there is a correspondingly rapid development in teacher training processes. Drawing on the authors’ experience in developing and delivering mindfulness-based training events and programs in the UK over more than 10 years, we discuss aspects of the training process that seem unique to this field and explore some areas to consider in future developments. We begin by outlining the development of mindfulness-based interventions within the UK context. We then provide an overview of the literature on the role of the teacher in ensuring the effectiveness of MBSR/MBCT and, thus, offer some context for the emphasis on certain forms of development processes for mindfulness-based teachers. Next, we turn to a theoretical analysis of how mindfulness-based interventions are understood to have their effects through supporting a radical shift of perspective from a ‘doing’ to a ‘being’ mode of mind and introduce how this affects the teaching and therefore the teacher training processes. In the next section, we describe the typical stages of training to teach MBSR/MBCT, the ingredients of a training program for prospective teachers, and recommended minimum training standards. Finally, some perspectives are offered on key development issues for mindfulness-based training within the UK context. North America and the UK have had different developmental pathways in this time of expanding interest in mindfulness-based interventions. Within the USA, the potential for mindfulness-based interventions reached public attention from the late 1980s onwards through Jon Kabat-Zinn’s work in developing MBSR as an addition to participants’ existing medical care (Kabat-Zinn 1990). MBSR is offered as an eight-session generic skills training course for people with a wide range of physical and psychological conditions. Participants engage in an intensive training in mindfulness meditation, which they learn to apply to the challenges of their daily lives. From the beginning, the effectiveness of the work was demonstrated through both open and randomised research trials and the program was the subject of a high-profile television program (Moyers 1993). In addition, a series of books for the general public describing the potential of mindfulness were very impactful (e.g., Kabat-Zinn 1990, 1994, 2005). All this triggered a groundswell of interest from the general public and health care professionals. The developmental path has been different in the UK. Here, a dramatic expansion in interest was driven by the publication in 2000 (Teasdale et al.) of the results of the first clinical trial of MBCT for the prevention of relapse in depression, the publication of the treatment manual (Segal et al. 2002), and the subsequent account of MBCT for the general public (Williams et al. 2007). Although this particular research was confined to depression, it triggered (particularly within mental health professions) interest in the potential range of applications of mindfulness-based interventions. Similar to MBSR in its form, structure, and teaching style, MBCT integrates aspects of CBT for depression into the MBSR program, thus targeting the learning towards particular client populations. The early research on MBCT was in relation to its effectiveness not in treating acute depression but in preventing depression for those known to be vulnerable to recurrence. MBCT is now being researched and used with people with a range of other conditions including chronic fatigue (Surawy et al. 2005), residual depression (Barnhofer et al. 2009; Eisendrath et al. 2008; Kingston et al. 2007), suicidality (Williams et al. 2006), and cancer (Bartley in press). Alongside these developments, supported by visiting teachers from the Center for Mindfulness in Massachusetts, USA, there has been a corresponding expansion of interest in the use of MBSR in the UK. Research has demonstrated that MBCT halves the relapse rate in recovered patients with three or more episodes of depression (Ma and Teasdale 2004; Teasdale et al. 2000) and produces outcomes comparable to maintenance antidepressants (Kuyken et al. 2008). MBCT is now recommended by the UK’s best practice advisory board for the NHS-NICE (National Health Service-National Institute for Health and Clinical Excellence) — as a treatment of choice for preventing future depression in those individuals who have experienced three or more episodes (NICE 2004). NICE’s recommendation of a new evidenced-based psychological therapy does not immediately translate into its availability on the ground to NHS patients. It does, though, have the effect of raising interest and expectations in a new approach amongst health care professionals and the general public. We find ourselves in the middle of a wide gap. On the one hand, there is plentiful grassroots interest in mindfulness-based approaches as demonstrated by patients wanting to access the approach, GPs wanting to refer patients (Mental Health Foundation 2010 — see also www.bemindful.co.uk), and increasing numbers of trainees joining training programs. On the other hand, there are too few teachers who are competent in its delivery and a lack of organisational and service commissioning support for the integration of mindfulness into psychological therapy service provision. Increasing the capacity to deliver MBCT takes time and, given the particular nature of the approach, also requires particular thought and care. All psychological approaches place a strong emphasis on the importance of rigorous therapist training. Indeed, there is evidence that certain training methodologies and longer trainings for cognitive therapy trainees deliver more effective outcomes for clients (e.g., Shafran et al. 2009). 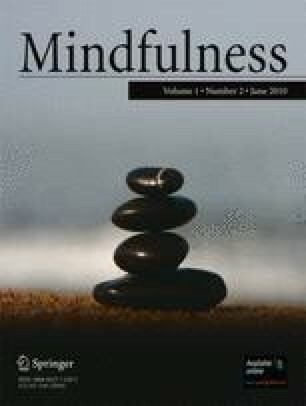 Mindfulness-based interventions are no different — the consistent and strong stance held by Kabat-Zinn and others who have followed is that the quality of the teaching (and therefore the training of the teacher) is a key ingredient associated with the delivery of successful outcomes for participants. The distinctive aspect of this in the current context is the emphasis placed on a particular form of development process — the teacher’s embodiment of the key ‘therapeutic ingredients’ of MBCT/MBSR and the personal mindfulness practice that supports this. Alongside developing competence in the ‘technicalities’ of delivering the approach, teachers engage in a highly personal process of exploring their own experience through the lens of their mindfulness practice on a continuing basis. This represents a shift in emphasis from other CBT approaches, in which there is a strong emphasis on the therapist developing skill and expertise, but less emphasis on personal practice as an essential aspect of the therapeutic encounter. The rationale for this priority placed on the mindfulness-based teacher’s embodiment and personal mindfulness practice is discussed below. To offer context for the discussion, we turn now to an overview of the distinctive origins of mindfulness-based applications and to the ways in which the influence of the mindfulness-based teacher is addressed in the literature. Kabat-Zinn (1990) pioneered the integration of mindfulness practice and teaching with contemporary approaches to stress and life challenges in his creation of the MBSR program. In this process, he drew on his own experiential immersion in mindfulness practice in the Buddhist tradition and on the scientific tradition in which he was trained. Kabat-Zinn also drew on medical and clinical understanding and a particular pedagogical approach to experiential learning. In this process, some very different intellectual and learning environments found themselves cohabiting. On the one hand, the medical, scientific paradigm emphasises theory, translating theory into practice, the cost-effectiveness of interventions, a focus on health outcomes, and a quest for ‘evidence-based practice’; on the other, the meditative contemplative paradigm emphasises the cultivation of particular ways of being, non-attachment to outcome, non-striving, and an apparently paradoxical turning towards painful experiences with an attitude of acceptance. On the face of it, these are unlikely bedfellows. There are tensions inherent in the process of applying a paradigm that emphasises measurement and outcome to a paradigm that has many dimensions that appear inherently unquantifiable. As challenging and complex as this process is, these integrations are informing an enriching discourse (McCown and Reibel 2009). When training mindfulness-based teachers, a key aim is to enable them to draw skilfully from each of these streams of learning (Box 1). The literature on the pedagogy of mindfulness-based approaches places considerable emphasis on the paramount importance of the teacher embodying the spirit and essence of the meditation practices being taught — of how this is the vehicle through which the teacher communicates the radical potential of bringing mindfulness to personal experience (e.g., Crane 2009; Kabat-Zinn 1990, 2003, 2005; McCown and Reibel 2009; Kabat-Zinn and Santorelli 2005; Segal et al. 2002). By contrast, within the outcome and effectiveness literature on mindfulness-based interventions, there is a dearth of information on the influence of the teacher — the emphasis (as in much of the literature on psychological approaches) is on the ingredients of the approach itself. Within the psychotherapy literature, there is an example of an exception to this. A randomised controlled trial of psychotherapists gives a strong indication that if psychotherapists meditate before therapy sessions, the treatment outcomes for their clients are more positive (Grepmair et al. 2007). Two influential meta-analyses of mindfulness-based interventions (Baer 2003; Grossman et al. 2004) highlight the lack of investigation of treatment fidelity and teacher effects. Indeed, these review conclusions are examples of a general movement within the wider literature on psychological interventions, towards greater acknowledgement of the importance of taking treatment fidelity into account when investigating effectiveness of an approach and when making the transition from research to everyday clinical practice. Direct experience through clinical observation consistently indicates that teachers’ personal engagement with mindfulness practice offers a basis from which they can develop the required competencies — that they are effectively not in a position to facilitate others in cultivating mindfulness, if they themselves have not brought it into their personal way of living and working. It is clear also that the impressive research findings to date are based on outcomes created by teachers who have experience and who personally draw on the foundations that gave rise to mindfulness (Kabat-Zinn 2003; Teasdale et al. 2003). Until there is empirical evidence backing up the key importance of particular competencies, there is some room for open-minded scepticism in this area, but current best practice by individuals and organisations offering mindfulness-based teacher training is based on the understanding that distinctive and particular training processes are required. In summary, there is no clear evidence base detailing the elements of mindfulness-based teacher competence and its relationship to participant outcome and there has been little theoretical development and empirical research on the training of mindfulness-based teachers. There is, though, a body of literature written primarily by MBCT/MBSR teachers in the field drawing on their direct experience of the process, within which there are clear descriptions of the essential elements of competence and a consistent emphasis on certain values that underpin the teaching process. An overarching principle is that the central mechanism through which mindfulness-based approaches have their effect is through enabling participants to be able to choose to shift from a ‘doing’ to a ‘being’ mode of mind, that this learning is communicated in the class through the teacher's direct personal experience of ‘being’, and that this experience is gained through mindfulness meditation practice. A key understanding that underpins mindfulness-based clinical practice is that our mind can operate in different modes (Williams 2008). Participants are learning that the avoidant and ruminative patterns of mind that trigger and maintain their depression, their stress, or other psychological distress are maladaptive aspects of their ‘doing’ mode of mind. They begin to see that any strategies they employ that involve further engagement of the thinking, conceptualising, problem solving, analytic ‘doing’ mode of mind can serve to keep the depression or stress-producing patterns and tendencies in play. Participants are learning to step aside from the struggle with these patterns by approaching them in a completely new way — through ‘being’ mode of mind. It is through their own personal mindfulness practice that MBSR/MBCT teachers develop this familiarity and the confidence in the use of mindfulness as an effective and tenable way of working with personal challenge. This confidence gained personally — direct knowing of the ‘landscape’ of ‘being’ mode — becomes an important ingredient, which enables the teacher to persist when supporting MBSR/MBCT participants who are struggling with the real challenges inherent with bringing mindfulness to their experience. The depth of experience that teachers have in exploring their own personal process through their mindfulness practice and through other personal development processes is thus held to be directly related to their ability to ‘meet’ the participants in a mindfulness-based class in this radically new way, thus creating a space in which participants can inquire into the actuality of their experience with compassion and free from the constraints of the inevitable ideas that arise about what could or should be happening. Following the lead therefore of the Center for Mindfulness at the University of Massachusetts Medical Center where Jon Kabat-Zinn and colleagues originated MBSR, the training programs that are developing in the UK context also place considerable emphasis on the development of ‘the person of the teacher’ through fostering an engaged inquiry into personal experience through mindfulness meditation practice (Box 2). Within a training process for MBSR/MBCT teachers, there is a blend of input that enables trainees to cultivate skills in accessing and dwelling in ‘being’ mode of mind and then to integrate this with new and existing conceptual knowledge, understanding, and skills. Table 1 gives some examples of the competencies that trainees are cultivating during mindfulness-based training in these different domains of ‘being’ and ‘doing’. The essential premise here is that the whole teaching (and training) process is mindfulness-based. This means that while teaching, teachers are able to draw fully on their ability to plan, organise, and conceptualise (‘doing’ mode of mind skills) whilst sustaining a wider perspective and the possibility of seeing the application of these skills within an open context of experiencing (‘being’ mode of mind skills). Every element of competence within mindfulness-based teaching therefore requires this integration of ‘doing’ and ‘being’ mode of mind skills. With this in mind, we summarise in Table 2 the dimensions of competence of an MBSR/MBCT teacher [taken from the Mindfulness-Based Interventions-Teacher Competency Scale (MBI-TRS); Crane et al. in press]. Having explored some principles underpinning mindfulness-based teaching and teacher training, we turn to a description of what a mindfulness-based teacher training program looks like in practice. Given that the transformative potential of mindfulness-based learning is reliant on gaining access to perspectives that arise during mindfulness meditation practice, it follows that professional training emphasizes the particular conditions within which these perspectives can be cultivated. There are multiple pathways through which mindfulness-based teachers arrive at this work. However, there are some common threads to the stages through which trainees move as they gain skills in teaching MBSR/MBCT. The following outlines the typical stages of a teacher training program. The first learning stage is an engagement in a mindfulness-based learning program from a personal perspective. This enables prospective trainees to directly explore what it means to systematically approach experience through the lens of non-judgemental attention and to discover some of the challenges and the fruits of this process. Many trainees embark on this first training step by attending an MBSR/MBCT course and then continue a personal mindfulness practice beyond this. The aims and intentions of this stage are to put in place the basic building blocks for teaching mindfulness-based classes at an advanced beginner level, with appropriate ongoing supervision. professional training and experience in the context within which they plan to teach MBSR/MBCT. sufficient depth of personal experience of mindfulness practice to begin the development towards teaching. This usually includes a daily practice and a regular engagement with the three main practices taught in mindfulness-based interventions (body scan, sitting meditations, and mindful movement practice). familiarity through direct experience with the 8-week mindfulness-based course structure and process. An additional requirement for trainees planning to teach MBCT is training in a structured evidenced-based psychotherapeutic approach such as cognitive behaviour therapy. Continuing to cultivate personal mindfulness practice through regular practice, participation in the 8-week MBCT course, and, on some training programs, attendance on largely silent mindfulness retreat lasting 3–7 days. The experience of a sustained period of retreat practice offers a qualitatively different experience to that of daily practice and enables dimensions of experience to be seen and then explored in new ways. Learning the theory and research that underpin mindfulness approaches. Learning the intentions, structure, and organization of mindfulness programs. Some programs teach elements of the Buddhist psychology that underpins MBCT. Practicing the core skills involved in teaching mindfulness-based approaches. Usually, students practice these skills first on peers and then teach courses to clients under supervision. Regular supervision with an experienced mindfulness-based teacher. This offers an alliance that enables an open and creative exploration on personal process, mindfulness practice, and the ways these interweave with mindfulness-based teaching practice. Completion of training to this level constitutes the recommended minimum training level for teaching MBSR/MBCT by the organizations represented by the authors. ongoing engagement in a regular supervision process with an experienced mindfulness-based teacher. Continued engagement with good practice guidelines for mindfulness-based teachers (see below). Participation in further mindfulness-based teacher training to develop learning and skills. A key overall intention of training at this level is to support participants in developing the ability and confidence to teach from the immediacy of their own experience. This tends to grow out of a depth of experience of mindfulness practice, the teaching process, and the form of the program. Training at this level is focused on refining existing skills, further developing understanding of the MBSR/MBCT teaching process and its underpinning themes and inquiring into the ‘person of the teacher’ — the way in which the teacher relates to themselves, the participants, the group, and the teaching process itself. These characteristic phases of training are represented in Fig. 1. Stages of training as a mindfulness teacher. an ongoing process of evaluating participant outcomes from mindfulness-based courses is in place, including benchmarking outcomes against those gained in trials of MBSR and MBCT. Opportunities to practice teaching skills and to receive structured feedback on this. The development of awareness through a systematic methodology of bringing attention to present moment experience during regular formal mindfulness practices (body scan, sitting meditation, mindful movement) and informal mindfulness practice (cultivating present moment awareness in daily life). The cultivation of a particular attitudinal framework characterised by compassion, kindness, curiosity, and a willingness to be present with the unfolding of experience without rushing to try to change it. Key to this is the intention to practice with openness to outcome. Paradoxically, it is through the focus on a predetermined agenda that we are taken away from the present moment leading to mental proliferation and unhelpful mind states, thus reducing the possibility of positive outcomes. A personal engagement with the implications of the paradox inherent within this is central to skilful communication of the approach to others. An embodied understanding of human vulnerability and resilience. This is developed through assimilating a particular view of the nature of human suffering and then exploring its validity through directly seeing one’s experiential process in action during formal and informal mindfulness practice. We learn through this that although suffering is an inherent part of our experience, there are ways that we can learn to recognise and step out of the patterns of habitually collaborating to perpetuate it, add to it, and deepen it (Crane 2009). Using the characteristic teaching style employed within MBSR and MBCT courses and teacher training programs (guided formal practice in sessions and at home, interactive dialogue between participants and teacher, group exercises and explorations), these three elements of personal engagement with practice offer the practitioner a comprehensive methodology through which to explore experience. They are also a way of offering mindfulness practice in a secular way that ensures that the critical aspects of mindfulness (within its original Buddhist context) known to bring about change are not lost (Teasdale et al. 2003). The learning for trainees starts from a highly personal process of engaging in a sustained study of inner direct experience. This is the springboard for a reflective investigation with self, tutors, and peers on their observations. Through this process, there is an overarching learning that naturally begins to take place. Trainees begin to see that the experiences that they have are less personal than they thought they were — human minds operate in similar ways. There is a process of seeing the personal in the universal and the universal in the personal. This process of inquiry continues beyond training through regular supervision. A key part of an MBSR/MBCT teacher training process is an engagement with an inquiry into the ways in which the approach enables participants to effect changes in their lives that reduce symptoms and the occurrence of existing conditions and increase general well-being and life skills. This takes place in two broad ways. Firstly, through engagement with a personal mindfulness practice: this enables an investigation on a personal level of what arises during moments of inattention (mindlessness or automatic pilot) and during moments of mindfulness as kindly attention is brought to the unfolding of experience, and through the recognition of the universal nature of these mind patterns. In this way, trainees are engaging in an exploration of the general vulnerability that we all carry by nature of being human. Mindfulness practice and teaching illuminate our understanding of the traits (shared by all humans) that tend us towards unhappiness and distress (for example, our use of language, our ability to operate in automatic pilot and to move our thought processes into the past and the future, and our physiological response to threat that does not discriminate between internal and external stimuli). The practice also offers us a way of working with these traits — enabling us to recognise them for what they are, thus reducing our tendency to add suffering to unavoidable pain (Williams 2008). Secondly, trainees develop understanding of the rationales for using mindfulness through clinical or other training, which orientates them to the theory on the processes creating and maintaining psychological distress. These can be seen as specific vulnerabilities — patterns, traits, or tendencies that are particular to the individual, which can be mild or considerably disabling. This may differ across the life span (childhood, adolescence, adulthood, older adulthood), by traditional diagnostic labels (e.g., depression, psychosis, anxiety), and by other life-defining roles and experience (e.g., carer, parent, person with life threatening illness or disability). The MBCT course is particularly intended to focus the learning around developing the skills to meet these particular or specific vulnerabilities, while the MBSR program is taught as a generic program (but not always — targeted versions of MBSR are increasingly employed). It is important that trainees arrive at mindfulness-based teacher training with existing clinical skills, experience, and theoretical understanding of the client populations with whom they intend to work. The mindfulness-based training process will then enable a fine-tuning of this existing knowledge in the light of mindfulness teaching and practice and the development of understanding of the ways in which mindfulness interfaces with particular vulnerabilities. Through both experiential and didactic teaching, trainees become familiar with the particular teaching intentions and underpinning rationale for each of the curriculum elements making up an eight-session course. A mindfulness-based class offers participants a series of experiential learning opportunities. There is then a dialogue with the participants to draw out their experience of these and to support them in connecting their direct experience to a context of learning, which is relevant to their daily life. Mindfulness-based teacher training processes are no different. Through the participatory, experiential nature of the teaching process, trainees are highly active in their own learning. A key ingredient of this is the opportunity to practice teaching skills and to receive structured feedback on this. Importantly, these teaching practice sessions are also used as a springboard from which trainees can inquire more deeply into their own process and through this to attune their ability to pay attention to the inner and outer processes that affect the teaching. This process offers a built-in supervisory experience as trainees gradually build their skills and confidence first with the training group and then with client groups. There is a broad consensus amongst the training courses represented by the authors on the competencies that need to be developed by teacher trainees (Crane et al. in press), and the framework outlined above elucidates a well-tested method for developing these. It is also clear that practitioners develop these competencies through other means than engagement with formal training programs. An alternative training model that some follow either alongside a formal course or as an alternative is an informal apprenticeship process. This typically involves participating in an 8-week course, developing a personal mindfulness practice, taking the 8-week course again from a perspective of ‘participant-observer’ (experiencing from the inside whilst simultaneously seeing the wider process of teaching and learning), assisting an experienced mindfulness-based teacher and receiving mentoring on this, and repeating this process while gradually taking on more direct responsibility for the teaching process. It is worth noting that as formal training programs in mindfulness-based approaches are relatively new, the developers of MBSR and MBCT (first-generation teachers) and now trainers (second-generation teachers) themselves went through this process just described. What are the particular areas that need to be addressed by the field now to support good-quality expansion of mindfulness-based training and clinical opportunities in the future? In this final section, we briefly describe the current status of MBSR/MBCT training opportunities in the UK, discuss some of the challenges faced by the organisations delivering training, and explore some potential directions for the future. There are currently three UK universities (Bangor, Exeter, and Oxford) offering training in delivering MBSR and/or MBCT. The Centre for Mindfulness Research and Practice within Bangor University’s School of Psychology trains in both MBSR and MBCT and offers two Master’s degrees — a specific program in Teaching Mindfulness-Based Courses and a general Master’s in Mindfulness-Based Approaches. They also offer a Continuing Professional Development program (www.bangor.ac.uk/mindfulness). Exeter University in collaboration with the meditation retreat centre Gaia House offers a Post-Graduate Diploma in MBCT (www.ex.ac.uk). Oxford University offers a Master of Studies in MBCT (www.mbct.co.uk) and other shorter MBCT training events through the Oxford Cognitive Therapy Centre (www.octc.co.uk). In Scotland, MBCT is included in a government-led strategy to increase the availability of evidence-based psychological therapies (Mental Health in Scotland). This and similar initiatives have provided funding and support to a group of NHS clinical psychologists and doctors who have trained staff to deliver MBCT using a framework similar to the one described above. The distinctive feature of this approach is that the training is designed to directly increase the capacity to deliver MBCT in a mainstream health setting, particularly for people suffering from recurrent depression (Mental Health in Scotland 2008). Other training initiatives in the UK are largely taken up on an individual level by practitioners (some self-funded and some sponsored by their employer) who are drawn to this particular form of training. There are also a number of independent organisations offering teacher training. A forum has been developed — the UK Mindfulness-based Teacher Trainers’ Network — to enable representatives from all the organisations directly offering training for mindfulness-based teachers to discuss best practice issues and to facilitate collaboration and coordination on development areas of mutual concern. How can this growing field maintain integrity in the face of the expansion in interest in the approach? There are some inevitable developmental processes and growing pains associated with the evolution and implementation of new psychological approaches. Some dedicated practitioners who have invested in developing considerable competencies in delivering mindfulness-based interventions find themselves working in a vacuum in which their skills are not fully recognised or supported. In the absence of formally defined standards and professional competencies for mindfulness-based teaching, some other practitioners are tempted to embark on using the approach before developing an appropriate level of personal and professional competence. The apparent simplicity of the approach belies the complexity of its radical implications. It is unclear in the current restructuring and re-visioning of psychological services in the UK how mindfulness-based interventions are perceived and where they might best be placed in terms of management and governance. Despite MBCT being cited as a treatment of choice in the NICE guidelines, its availability on the ground in the UK is patchy (Mental Health Foundation 2010). The expansion of interest in the approach has been driven largely by mindfulness teachers who are inspired by its potential rather than psychological service managers building it into the service framework. This can lead to mindfulness teachers feeling frustrated by a lack of support, understanding, and recognition from management. Some health professionals funded to train as mindfulness-based teachers report that they are encouraged to commence delivering the course (or even to commence training colleagues) before they themselves have reached the minimum training standard. Other health care professionals describe the experience of endeavouring to introduce mindfulness-based courses into their clinical service as being like ‘swimming upstream’. The NHS is rightly committed to implementing approaches that are of proven efficacy, resulting in a prevailing organisational culture of target setting and a focus on measurement. It is too easy for this goal-driven organisational culture to also become an overriding personal ‘way of being’ for the clinical staff working within it. For the teacher of MBSR/MBCT working within a highly ‘doing’ orientated culture, there are both practical and personal challenges that need working with in ways that allow the essential integrity of the course to be available to participants. This requires some vigor on the part of the teacher to carve out the personal (and often the physical) space within which the work of teaching MBSR/MBCT can take place. Mindfulness-based interventions are particularly suited to enabling individuals who have a recurrent or chronic condition to explore and work differently with their particular vulnerability and to gain skills to enable effective ongoing management of their condition. The reality of the NHS, as with other health systems internationally, is that it is geared towards “firefighting” acute problems rather than supporting the development of preventative skills. Mindfulness teachers are often unable therefore to dedicate resources to supporting clients to develop skills that will enable them to stay well in the future. We are at an early stage in understanding the mechanisms that create the positive effects of mindfulness-based interventions or that are the critical variables of the approach that seem to best predict change. These areas are the focus of clinical investigation and research programs worldwide (e.g., Kuyken et al. 2008; Williams et al. 2006). An aspect of this that needs particular attention is the critical variables of the teaching process itself — what are the key competencies of mindfulness-based teachers also associated with positive outcomes for clients? Careful clinical practice has certainly elucidated this considerably over the past 10 years and more. Training organisations have articulated the areas of competence through experience and understanding of the work. It is widely supposed that subtle inner qualities of the teacher — their ability to be present with themselves and with participants with warmth, curiosity, care, and compassion — facilitate change. There is a need now to strengthen these clinical understandings with systematic investigation using a range of methodologies. There are challenges and tensions inherent in this process of investigating and articulating the competencies and personal qualities of the mindfulness-based teacher. Research on therapist effects is notoriously challenging and mindfulness-based teaching and learning processes are particularly multifaceted. A central aspect of the learning in a mindfulness-based context is the development of skills in approaching experience in a nonconceptual way — this leads to dimensions of experience that are inevitably different from some aspects of the intellectual scientific medical paradigm that is used to investigate them (McCown and Reibel 2009). The methodological challenges in investigating this area are immense, yet neuroscience research using FMRI is beginning to show distinct signatures of the nonconceptual (experiential) processing skills that are cultivated through mindfulness training (Farb et al. 2007). Despite these challenges, amongst mindfulness-based training groups in the UK, there is an emerging consensus on what teacher competence ‘looks’ like — its observable and behavioural elements (see Table 2; Crane et al. in press). Sensitive clinical and research work is required, which enables understanding to develop about which competencies are central to achieving effective outcomes and to enable these to be reliably rated. In this way, the generally held hypothesis that high levels of experience and particular skills are required to effectively deliver an MBSR/MBCT course and thus achieve desired outcomes for participants can be tested. As understanding of mindfulness-based teacher competency is refined, there will be the potential to refine current training practice to ensure that the key skills are given further emphasis. Only then will future research be able to investigate what length, format, and delivery style are most effective in developing particular teacher competencies and in enhancing participant outcomes. Throughout this article, we use the word ‘teacher’ rather than therapist to refer to the practitioner delivering the intervention. This word captures the nature of the activity that takes place in an MBSR or MBCT classroom—that of teaching and learning new skills. We would like to acknowledge the generous sharing of experience in teaching and training by MBSR teachers from the Center for Mindfulness, Massachusetts, USA, which has nourished and sustained developments in the UK since early beginnings in 1999. We also wish to thank colleagues in each of our centres who have shaped our training programs, in particular Trish Bartley, Cindy Cooper, Michael Chaskalson, David Elias, Eluned Gold, Annee Griffiths, Vanessa Hope, Jody Mardula, Sarah Silverton, Judith Soulsby, Claire Breijca, Alison Evans, Christina Feldman, Jenny Wilks, Melanie Fennell, Charlotte Procter, Stewart Mercer, and Alistair Wilson.